What I find most exciting about exploring mandalas is that the creative possibilities are endless. There is truly something for everyone – drawing, coloring, painting, photographing, and working digitally. 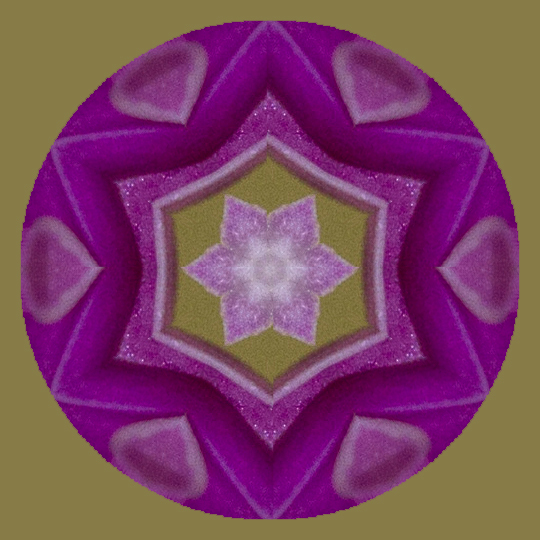 For today’s post I reached out to Sue O’Kieffe who has been creating mandalas taking her photos of nature and then plays with them on the computer. I was curious to learn more about her mandala journey and how she makes these radiant works of art. Tell us about your mandala journey – when and how did you get started? My earliest memory of what might be an introduction to mandala making was playing with a Spirograph that my mother had saved from her own childhood. But I would say my first real experience with mandala making occurred around 1997. I participated in a workshop led by a woman who had been trained by Judith Cornell. Cornell created a lovely and very powerful approach to mandala making based on the concept of drawing with light by laying down layers and layers of white Prismacolor pencil on black paper before adding subsequent layers of color. That weekend was powerful and transformative and one of my first conscious experiences of connecting with the Divine through art making. I loved creating within the container of the circle. 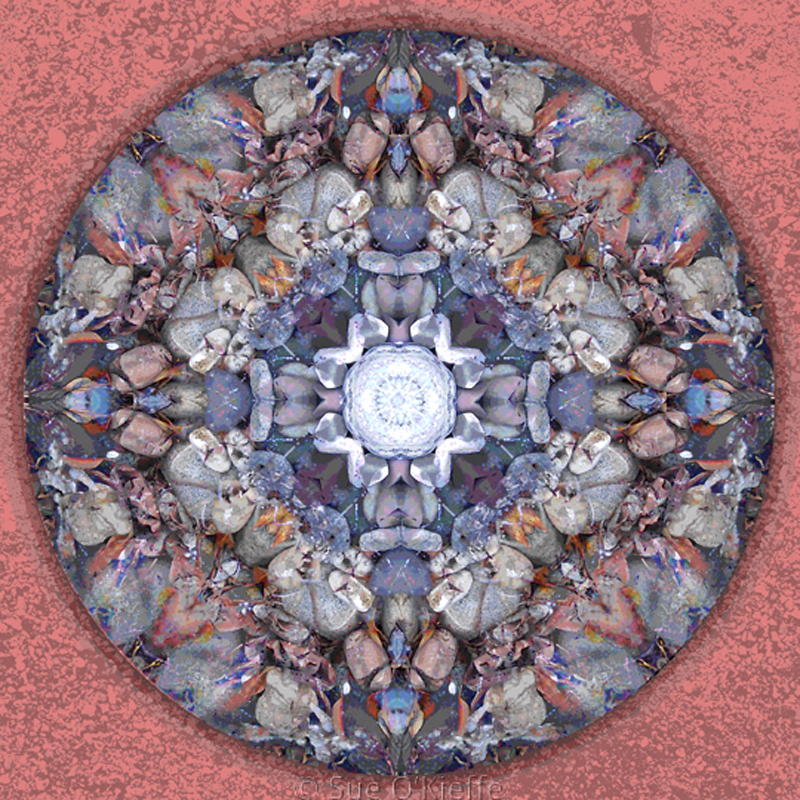 What is your process for creating your digital art mandalas? My first step, really, is to gather my materials. I am fortunate to live around so much natural beauty, and I go out on photoshoots as often as I can. 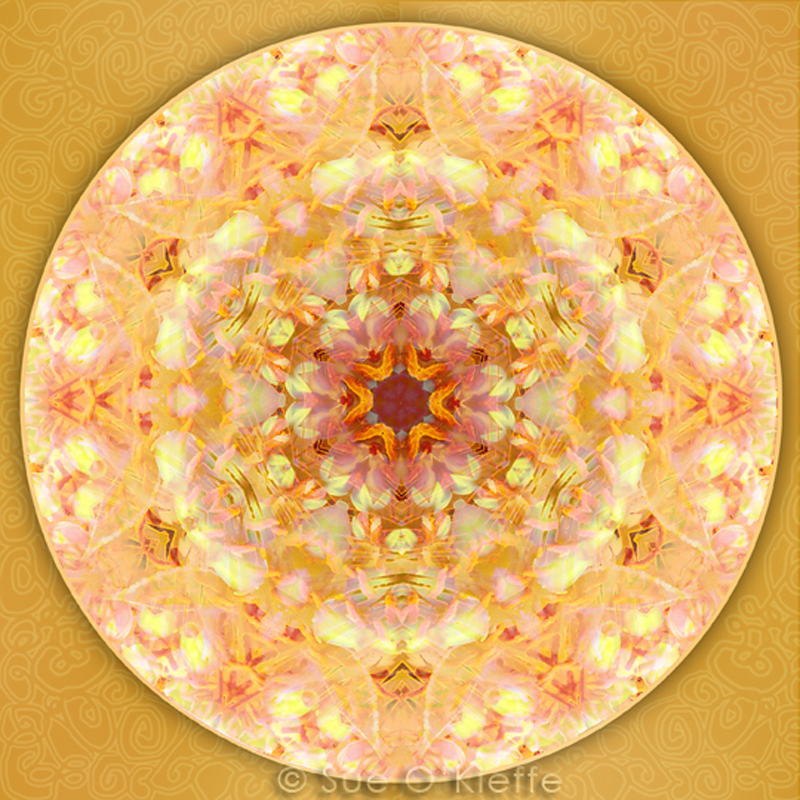 I have a series of templates that I use to create these mandalas. I use the 6 wedge template most often because of its relationship to the Flower of Life and other sacred geometry patterns. I also like the 8 wedge template. I follow the tutorial that Komra created and have added my own flourishes and embellishments to that. If you work in Photoshop and would like to experience this process yourself, you can download my newly revised tutorial based on Komra’s early work HERE. 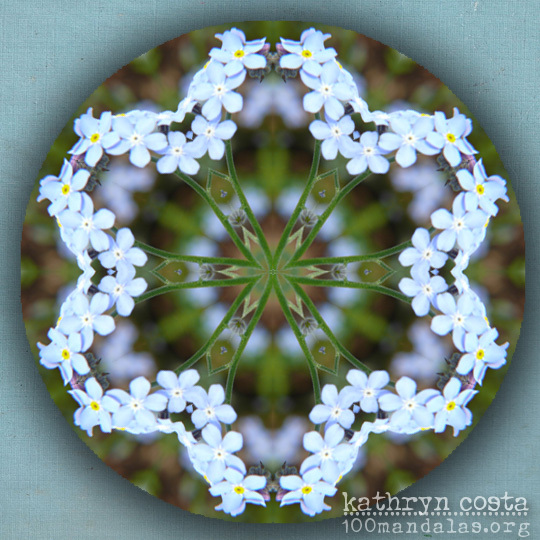 How is creating mandalas a spiritual practice for you? My desire is to create a container for myself where creating mandalas is more an act of devotion than “practice” or “discipline”, which to me feels rigid and no fun. Through these mandalas, I am connecting with the Divine and requesting that Universal Love pour through me and be expressed in them. Also, when I am out in Nature, it is my intention to communicate with the plants and flowers I interact with and bring that energy through the mandala art. They are offering their love for us within the mandala form. 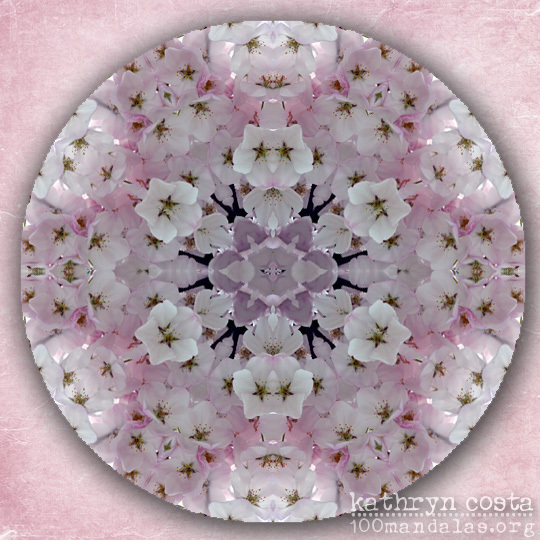 What tips or advice do you have for someone new to creating mandalas digitally? Play. Have a lot fun. If you work in Photoshop, I recommend familiarizing yourself with the Layers Palette and learn how to work with adjustment layers. If you don’t have Photoshop and want to work digitally, there is other software out there that you can use to do this. 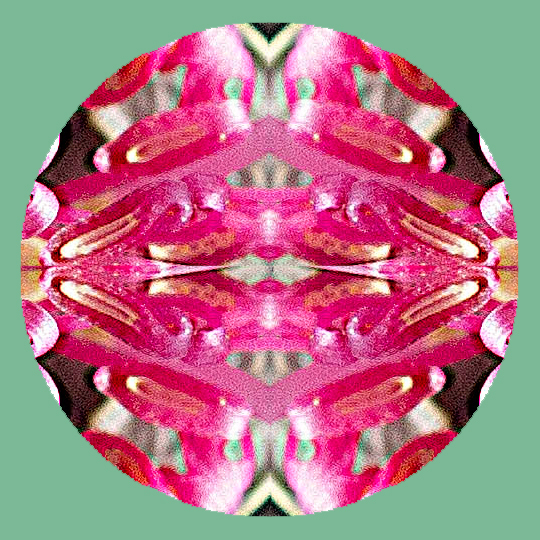 Jasc’s Paint Shop Pro has a kaleidoscope filter. 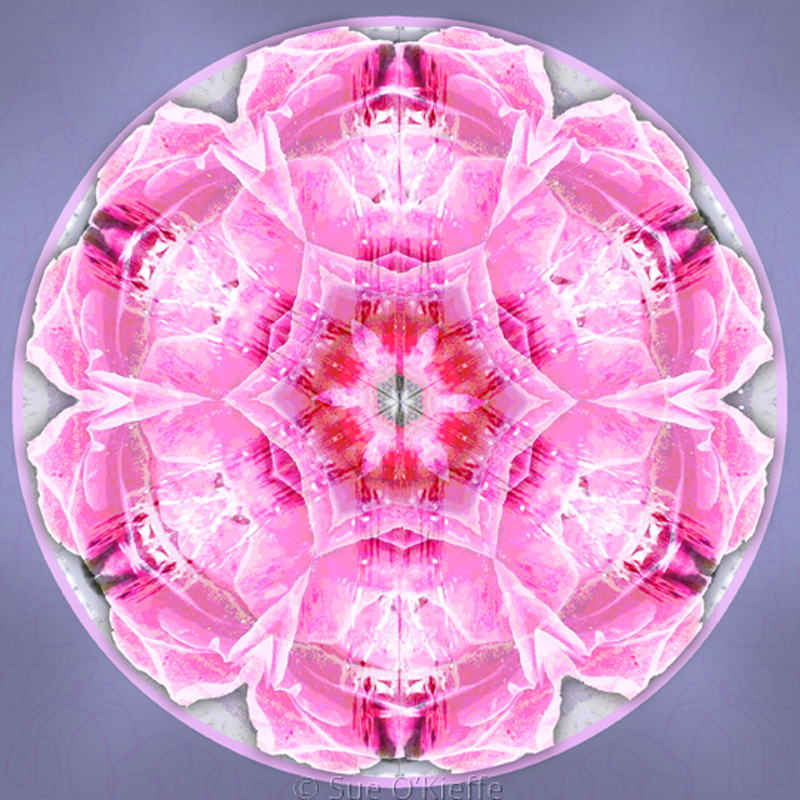 Kaleidoscope Kreator is fairly affordable software. Another digital mandala artist I know uses Mandala Painter with excellent results. 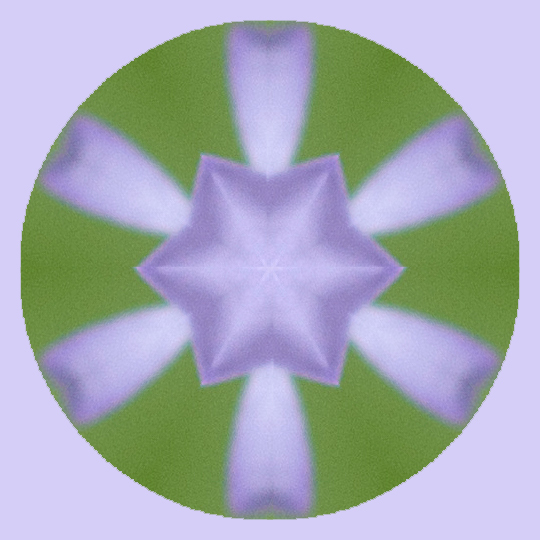 I understand that you can also create mirror images (which is what you need to create digital mandalas) in GIMP, and this software is a free download. There are tutorials on YouTube that will show you how to use it. 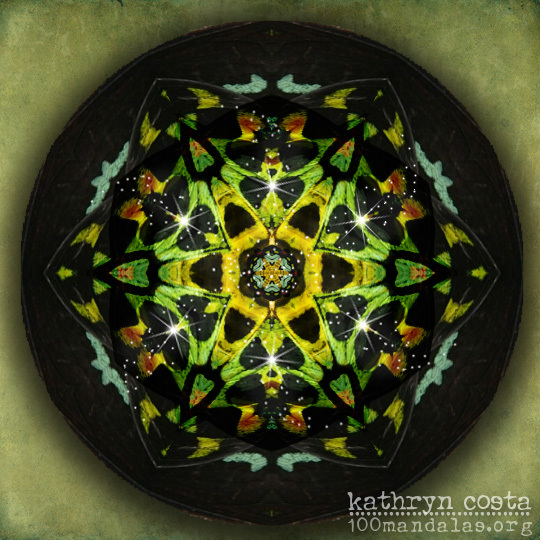 There is also a fun plug-in that creates kaleidoscope imagery from photographs available here that can be used in Photoshop and Photoshop Elements. It’s free and easy to use (WARNING: also kind of addicting). 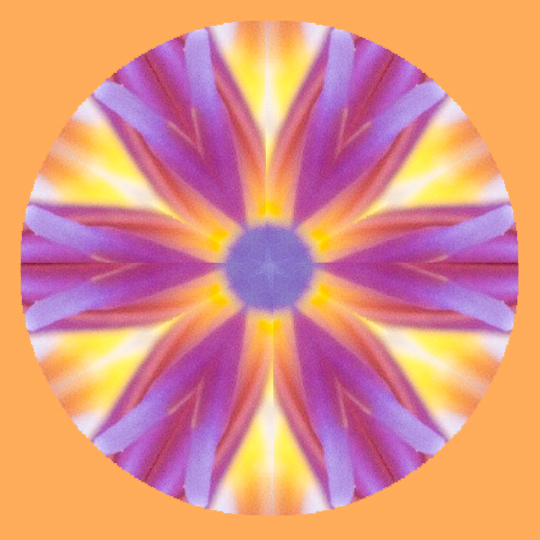 And there are mandala apps available for your smartphone or iPad. Also, if you are working with your own photographs, I recommend a camera with as many megapixels as you can afford. You will create lush, detail rich images. I started out with a 2 mpx camera (Can you believe?). The camera I use now is 16 mpx. There is so much calling to me, Kathryn. I am currently fascinated with the possibilities of learning how to communicate more directly with garden plants and those in the wild. I took an introductory class this fall on plant communication and am now reading Stephen Harrod Buhner’s book The Secret Teachings of Plants to help me along. I can hardly wait for a bit warmer weather to immerse myself in this more fully. I’m also feeling a pull to create hand drawn mandalas using a compass and protractor. I’ve shied away from this in the past because of past trauma from 10th grade geometry class. 😉 I see myself converting these mandala outlines to Photoshop brushes to use in my digital work before adding color to them. And, within, the next year, I also hope to finally get my website up. It is long overdue. I couldn’t resist having a play with Sue’s tutorial. 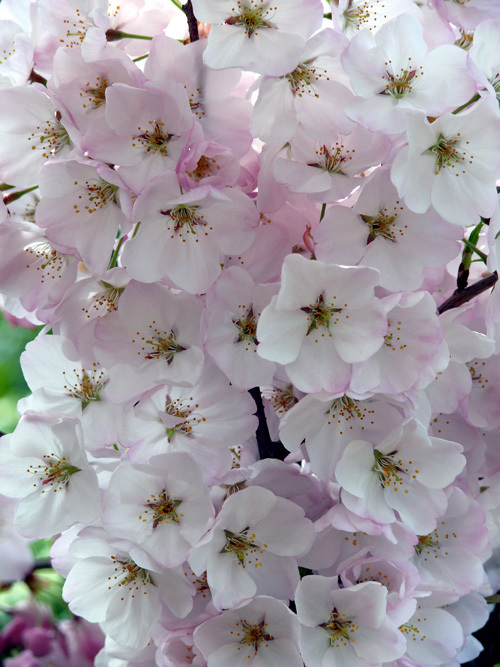 I started with this cherry blossom photo taken in Washington, DC. It was a special trip marking the 1-year anniversary of when my husband and I met. This mandala will commemorate this moment in time of when our life together was first blossoming. 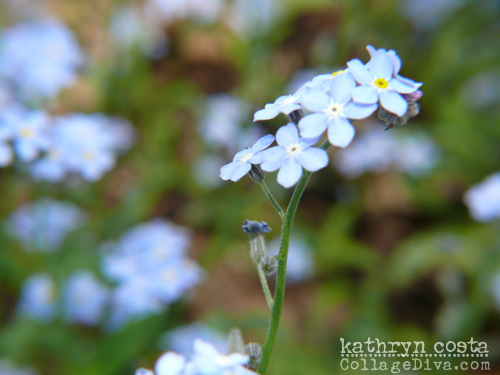 The stems of a Forget-Me-Knot plant created an interesting design. I think I’ll refer to this mandala in the future when I’m looking for some different patterns to draw in some other mandalas. It was fun piecing this mandala together. It is a very different process than working with a program that generates the design for you. I felt like I have a better understanding of the patterns and elements in this mandala for having worked through the process. 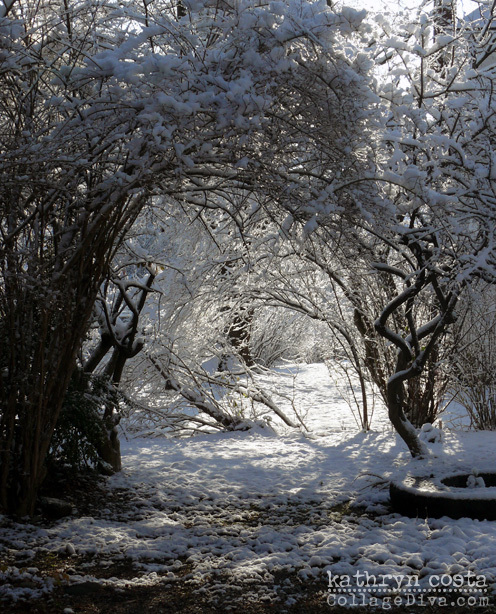 For this mandala, I pulled out a photo of a snowy path taken in Portsmouth, NH several years back. It has been icy cold here this week and this mandala captures that feeling. I liked how the crooked tree trunk formed an interesting pattern in the center. What path will you following in your mandala play? 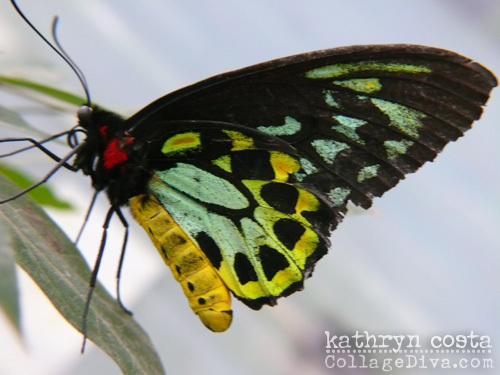 This last example is a composite of two mandalas that I created using the same photograph of a butterfly. After I created the first mandala, I felt like it needed something so I went back to the photo and created another mandala. I wondered how they would look if I put one over the other and resized the top one. 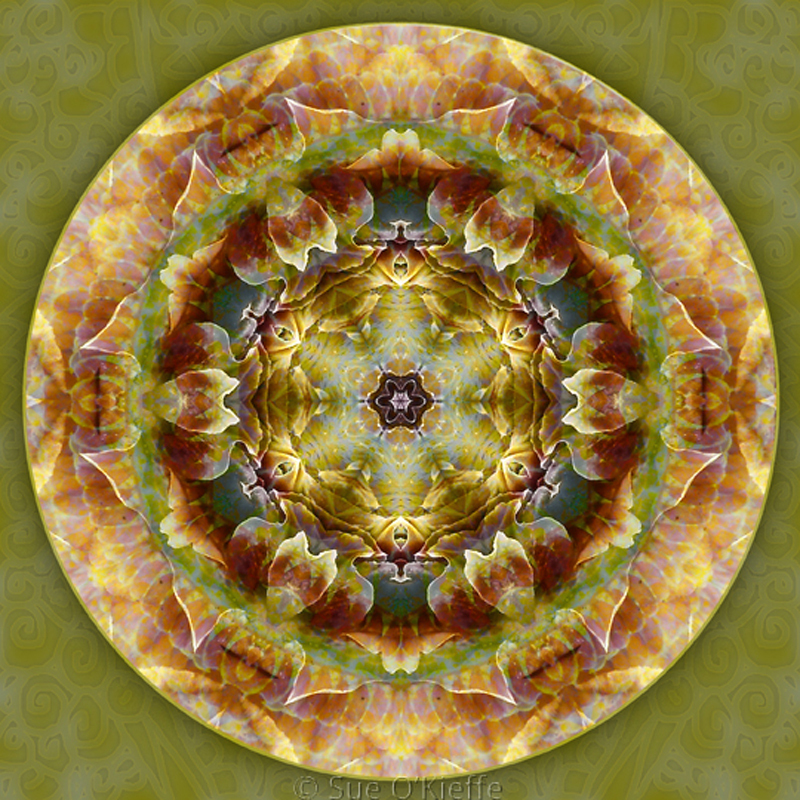 I used the blending options in the Photoshop layers palette to pull together elements from the two mandalas. The center needed something so I repeated one of the mandalas and reduced the size. I finished the layout by using a star brush to add a little magic and light. 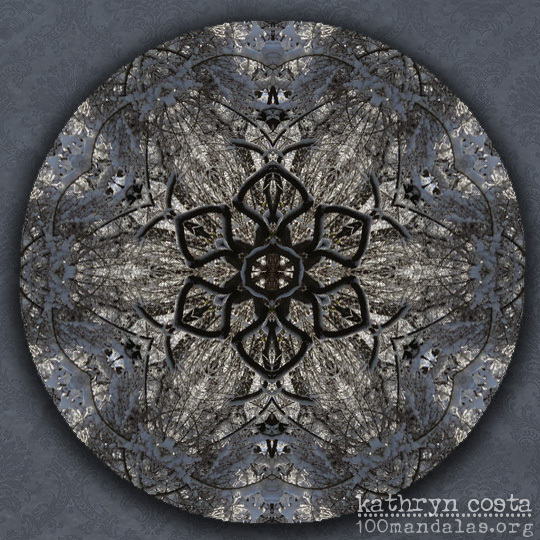 I’m calling this mandala “Transformation.” I like how it ties in with the themes that I’ve been playing with this month: the black ground, shining the light within, and opening myself up for new insights. Megan Warren played with the tutorial too. These are splendid! Definitely going to have to have a go myself.